Nothing but league upon league of seemingly unending wilderness. That is what my children and I encountered as we attempted to traverse the old Indian trail through the Long Woods. My husband, Major Adam Muir of the 41st Regiment of Foot had been captured, so as we watched our home in Fort Malden burn on that day in October 1813, my only thought was to go east. With only a decrepit wagon and an ailing horse, my young children and I set off alone and unprotected, following the directions we had been given to Ward’s Tavern. The first night, the Wards welcomed us with simple satisfying fare. With great reluctance we began an even more arduous arm of our journey the next morning. The road built by the Moravians to a width of 15 feet narrowed as we continued eastward. Master Ward instructed us to keep a lookout for the hatchet marks on the tall trees but they were difficult to see along the path where no sunshine penetrated the thick, overhanging trees. Swampy land, slippery fallen leaves and steep ravines hindered our advance. Many times I feared we would not again find the trail. We witnessed rough, cone-shaped shelters constructed of wood and branches along the way. I believe Master Ward referred to them as ‘’wigwams”. Despite our weariness, I was reluctant to tarry for fear of wild animals and wandering soldiers. Although others were journeying in an eastern direction as well, we only encountered travelers after we reached the settlement of Delaware where the Brigham family kindly provided shelter and sustenance. We stayed briefly and left hurriedly to make our way to York. Stott, Glenn, Greater Evils: The War of 1812 in Southwestern Ontario, G. Stott Publishing, Arkona, ON, pg. 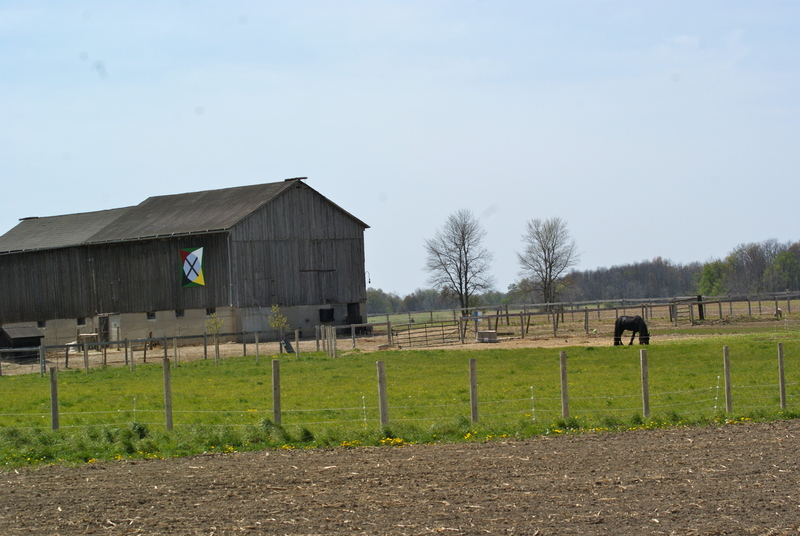 Posted on June 16, 2012, in First Nations, Longwoods Barn Quilt Trail, War of 1812 and tagged Longwoods Barn Quilt Trail, old Indian trail, War of 1812. Bookmark the permalink. Leave a comment.